Hungkar Dorje Rinpoche Teaching Event in San Jose, CA. Venerable Hung Kar Dorje Rinpoche is returning to the United States in February 2006, and will offer a weekend of teachings on February 18-19 in San Jose, California, organized by the Shambhala Land Foundation, co-sponsored by Dharma Gates Group. 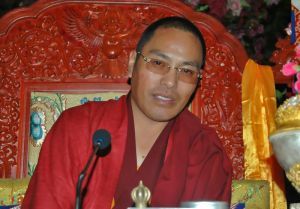 Lama Sherab will assist Rinpoche with translation into English. COST TO ATTEND: Suggested $75.00 per person. Organizing team sponsors all event expenses. 100% of all contributions will go to support Rinpoche's dharma and community projects. ACCOMMODATIONS: Accommodations are arranged for all registered participants to stay in the same hotel at discounted rates. This is a clean and comfortable full service hotel across the street from the event location. Please ask to register under: Shambala Land to receive the group discount rate which includes breakfast. With apologies for the short notice, please contact the organizing group directly for further information if you are interested in attending this program on applying wisdom and skillful means to your life and your practice. There will also be opportunity for personal interviews with Rinpoche.